During the four years of researching and writing A Pair of Wharfedales, there were many occasions on which I asked complete strangers whether they had heard of Wharfedale loudspeakers. Almost invariably in the case of men, and also for a substantial number of women, aged over 50, the answer would not only be “yes”, but would be followed by either: I have a pair (in use, in the garage or in the loft); I once had a pair; my father had a pair; I wished I could have afforded a pair. Out of their mouths came the title for the book. Not many, though, knew anything about the remarkable man behind the loudspeakers and the firm that made them. Gilbert Arthur Briggs, G.A.B. to those who knew him well, was born into a humble family in a Yorkshire textile village in 1890. His father died when he was nine and he went to an orphans’ school. Despite this inauspicious start in life he rose to become a director of a firm of textile export merchants in Bradford, but was virtually bankrupted in the Depression. A passion for music and a love affair with the piano had led to an interest in loudspeakers and, as the textile industry collapsed, he started a sideline to make them, called Wharfedale Wireless Works. He was forced to turn this into his full-time occupation in 1933. He had no relevant, theoretical or practical training, yet both he and Wharfedale became internationally famous, and when he died Gilbert’s obituaries referred to him as ‘the father of hi-fi’. His contribution to the development and popularity of ‘hi-fi’ was unique and profound. As well as designing loudspeakers and growing his company, he wrote twenty-one books on various aspects of sound reproduction and audio for amateurs, published through Wharfedale, with total sales worldwide of well over a quarter of a million copies. He also staged a series of over twenty audacious lecture-demonstrations in major concert halls during the 1950s (including the Royal Festival Hall, London and Carnegie Hall, New York) which featured “live versus recorded” performances. A straight talking Yorkshireman, with an impish sense of humour, Gilbert possessed many human qualities which drew people to him. Very few recruits to Wharfedale during his 30 years at the helm left the firm and, through a combination of sincerity, integrity, charm and prodigious letter writing, he built up, and maintained, a huge network of friends throughout the audio world. It was their willingness to help him, when asked, which made his writing and concert activities both possible and successful. Once he left the “rag trade”, Gilbert rarely referred to this first career of nearly 28 years. Unlike most of his peers amongst the “audio pioneers” he had not gone into the industry as a young man and his formative experiences and influences were quite different. However, the foundations for the things that he did with Wharfedale, which so surprised his colleagues at the time, were all laid during this period—indeed by the time he was 30. One of the fascinations of my research was to uncover these traits and see how they played out in later life. 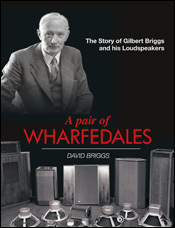 This, then, is the story of Wharfedale, the company and its products, and the remarkable G.A. Briggs who started it all. For the benefit of readers with different interests, I have tried to keep these two narrative streams separate, in as much as this is possible, whilst writing chronologically. Chapters covering the period when Gilbert was running Wharfedale (1933–1964) are in two parts, the first dealing with Wharfedale and the second mainly biographical. Once he retired, but continued to run the Wharfedale “Book Department” from his Ilkley office, separate chapters cover this period in his life and events at Wharfedale until his death in 1978. Although the sagas of his books and concert-demonstrations are covered briefly in the chronology, they are described fully in two final chapters. A short Epilogue brings the Wharfedale story up-to-date. The history of the company’s products is quite detailed and a full list, with prices, from during Gilbert’s lifetime (over 250 items) is provided in one of the Appendices. Enthusiasts of hi-fi sound in its early days will find this book a compelling read as they, at last, learn who was behind the Wharfedale speakers that were their pride and joy, and how their creator took on international competition and produced the best high fidelity speakers of his time. For those born in the last fifty years, most of whom take high fidelity sound as given, it presents the chance to learn of the creative advances that were needed to achieve the clear and transparent sound they enjoy and take for granted. David Briggs BSc (Chem. ), PhD, DSc received his degrees from the University of Durham. His career as a research scientist included 27 years with ICI plc, when he also held a number of visiting professorships, and six years as Professor of Surface Chemical Analysis at the University of Nottingham. During this time he published over 200 papers/articles and 10 books in his specialised field. In addition he was editor-in-chief of an international journal, a consultant and co-founder of a niche publishing company. Since retiring, family history has become the focus of his research. He is married, with one daughter, and lives in Worcestershire. David Briggs’ grandfather was Gilbert Briggs’ first cousin. We are very sorry to report that Dave Briggs died on 9 January 2018.